Thank you to everyone who participated in our 2019 Annual Conference survey! Each year we work to make the Annual Conference better than the year before. It’s a large effort that takes the time of many people. We only do it once year but we need to have it perfect from that first hour registration is open, and your direct feedback helps us make that happen. Planning to submit a proposal for CAA 2020? The submissions portal for next year’s Annual Conference in Chicago closes April 30. 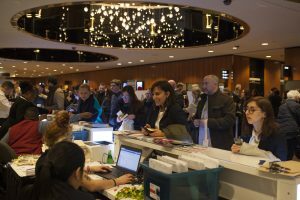 We invite proposals for sessions, lightning rounds, poster sessions, and workshops from visual arts professionals working across the field in all disciplines. CAA invites nominations and self-nominations for individuals to serve on ten of the fourteen juries for the annual Awards for Distinction for three years (2019–22). Terms begin in May 2019; award years are 2020–22. CAA’s fourteen awards honor artists, art historians, authors, curators, critics, and teachers whose accomplishments transcend their individual disciplines and contribute to the profession as a whole and to the world at large. Candidates must possess expertise appropriate to the jury’s work and be current CAA members. 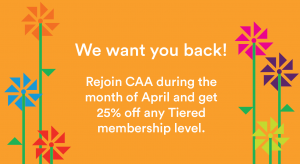 They should not hold a position on a CAA committee or editorial board beyond May 31, 2019. CAA’s president and vice president for committees appoint jury members for service. Nominations and self-nominations should include a brief statement (no more than 150 words) outlining the individual’s qualifications and experience and a CV (an abbreviated CV no more than two pages may be submitted). Please send all materials by email to Cali Buckley, CAA grants and special programs manager; submissions must be sent as Microsoft Word or Adobe PDF attachments. For questions about jury service and responsibilities, contact Tiffany Dugan, CAA director of programs and publications. CAA invites nominations and self-nominations for the Annual Conference Chair. This at-large member of the Annual Conference Committee serves a two-year term, beginning February 2020, immediately following the 108th Annual Conference. The Annual Conference Chair Designate shall begin their orientation to the role in May 2019. They will be invited to meetings of the Annual Conference Committee as a non-voting ex officio member at that time. The Chair oversees the Council of Readers and reports back to the Annual Conference Committee on session topics, including identifying possible areas of content and interest to members that are missing from the submissions received. With CAA staff, the Chair recruits Council of Readers members to read, review, and rank proposals. The Chair shapes the content to the Annual Conference from the submissions as reported back by the Council. Assists in scheduling the variety of chosen sessions, workshops, talks, etc. The Annual Conference Committee meets three times a year: February – in person at the Annual Conference to examine and discuss the operational aspects of the conference which recently concluded and ideas for the upcoming conference; May/June – on a conference call to review the recommendations by the Council of Readers for the upcoming Annual Conference; October – on a conference call to review final plans and any existing changes for the Annual Conference up to two years out. Please send a 150-word letter of interest and a CV to Mira Friedlaender, CAA Manager of Annual Conference. Deadline: April 29, 2019. Beginning this year, we are pleased to announce a new opportunity to help shape Annual Conference session content. In preparation for the 2020 Annual Conference in Chicago, the Annual Conference Committee will appoint a Council of Readers to read proposals submitted by CAA members and serve a crucial role in the review process. The Council will be tasked with reading proposals within their specialty and will provide the knowledge and expertise of their fields to help shape the conference. Time commitment to read and review up to 60 proposals online in May 2019. Proposal lengths range from a single 250-word abstract to a complete session with multiple presentation abstracts totaling, for example, 1000 words. Readers will review no more than 60 proposals each. The Council of Readers is group of 50 to 75 CAA members from Professional Committees, Affiliated Societies, and general membership overseen by the Annual Conference Committee chair. Readers will be asked to review proposals matched to their areas of interest or specialty. Readers with broad areas of interest are encouraged to participate. The proposals will be distributed in the first week of May and must be completed by May 31. Each proposal is read and reviewed in the online portal by three different Council members. Each member of the Council of Readers reviews no more than 60 proposals. Proposal lengths range from a single 250-word abstract to a complete session with multiple presentation abstracts totaling, for example, 1000 words. For CAA 2019 the Committee reviewed over 1500 abstracts. For each proposal, readers will use a scale of 1-5 to answer five questions and also enter a short comment for the Annual Conference Committee’s review. 2020 Readers will each access abstracts to review in our online system, with orientation and support from the Annual Conference Committee and CAA staff members. Members of the Council of Readers serve a three-year term on a rotation so that each year, one third of the council is new. Review is independent; the Council of Readers does not meet together in-person or electronically. After proposals are read and reviewed by the Council, the chair reports to the Annual Conference Committee on session topics, including identifying possible areas of content that are missing from the submissions received. The chair shapes the conference content based on the reviewed submissions. Pleas email Mira Friedlaender, Manager of Annual Conference, mfriedlaender@collegeart.org, or Tiffany Dugan, Director of Programs and Publications, tdugan@collegeart.org, with any questions. 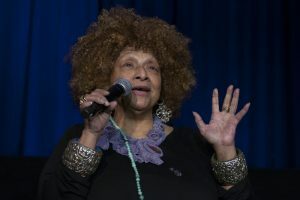 2019 CAA Annual Conference Keynote, Joyce J. Scott. Image by Ben Fractenberg. The submissions portal for the 2020 CAA Annual Conference in Chicago, February 12-15 is now open. CAA invites proposals for sessions, lightning rounds, poster sessions, and workshops from visual arts professionals working across the field in all disciplines. 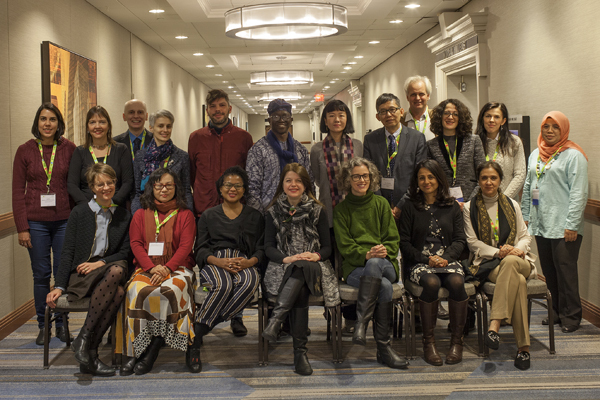 The CAA Annual Conference is the largest gathering of art historians, artists, designers, curators, arts administrators, museum professionals, and others in the visual arts. Proposals must be submitted by April 30, 2019. Please note, this year individuals will have the opportunity to submit proposals for several types of opportunities at the Annual Conference before the April 30 deadline. Please review the full proposals page to decide which type of submission best fits your needs. The Annual Conference Committee members reviewed over 1,000 submissions for the 2019 Annual Conference. They take into account subject areas and themes that arise from accepted proposals to present as a broad and diverse a program as possible. Last year the committee selected roughly 300 sessions and it must, at times, make difficult decisions on submissions of high merit. Please contact Member Services at membership@collegeart.org or at 212-691-1051, ext. 1 with any questions. Did you attend the 107th Annual Conference? We want to hear from you. Let us know what worked, what didn’t, and what you’d like to see next year in our online survey. We appreciate your feedback and hope to see you next year at the 108th Annual Conference in Chicago, February 12-15, 2020. The submissions portal opens March 1.